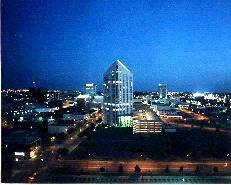 Wichita, about 165 miles southwest of Lawrence on I-35, is the largest city in Kansas. Originally settled by the Wichita Indians, Wichita grew up as a stop on the Chisholm Trail. Its glory days were to be short-lived, however, as farmers, angry about the damage done by stampeding cattle, erected fences which forced the drives onto different trails further west, creating new cowtowns such as Dodge City. Today three of the world's major aircraft manufacturers (Beech, Cessna and Lear) are based here, and although downtown is wilting a little, Wichita remains attractive thanks to its great museums and a rich arts scene.